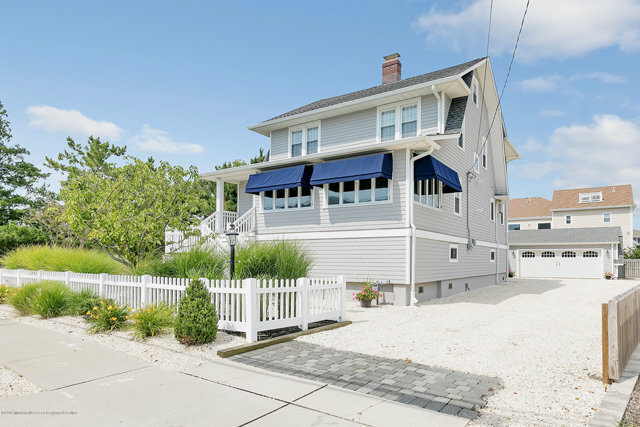 Single Family,Detached, Shore Colonial - Mantoloking, NJ This inviting home is not far from South Beach. The immaculate first floor is open and sunlit, and yet offers multiple living spaces in which to entertain, or to get away... Wood floors throughout the first floor, a modern kitchen, an enclosed front porch, and a rear deck help to make this home ideal for summer or year-round living, as well as entertaining. The living room offers a fireplace for a chilly day or night... Upstairs, one finds a master suite, plus 3 additional bedrooms, including one on the 3rd floor. The elevated deck overlooks the yard, and offers a shaded seating area underneath... The gravel drive and two car garage offer ample parking. This home has been elevated, and offers great storage space underneath!